Not that we’d sacrifice Teen Mom (duh! ), but remember when you could watch your favorite singer or band ON TV during a non-award ceremony, non-morning show segment? Yeah, it happened. And though MTV originated in the ’80s, I personally think it was prime a decade later. 120 Minutes was a super rad late night show that showcased alternative and indie artists such as Oasis, The Smashing Pumpkins, Weezer, The Offspring, and many others. They’re even responsible for the world premiere Nirvana’s iconic Smells Like Teen Spiritso in case you’ve never seen any of the rockin’ episodes (which moved to daytime rotation and sparked the sister program, Alternative Nation before moving to MTV2, and then off the air), just know how completely boss they were. Here’s what the heigh of technology looked like in the ’90s: Landlines, dial-up Internet (or no Internet), and this sweet little device called a pager. If you have no idea what I’m talking about, it’s that rad piece of plastic that Dr. Grey wears when there’s an emergency. It’s not like I needed one. Who could possibly page me I didn’t already see at school or live with? The answer is no one. But having a pager was the coolest way to contact someone because who knows – they might call you back, and they might not. Oh, the suspense! And don’t get me started on the super secret pager language. Just saying what’s up? How about 07734. It spells ‘hello’ when turned upside down on a pager AND a calculator! Need to talk but it’s not an emergency? Punch in 121. I’ll get it. Or maybe you’re afraid to tell me how you feel about me and need a discreet way — hit 143 — I (1) Love (4) You (3). Once I actually figure out the code, I’ll totally swoon. Mad props to One Direction, but I’ll never forget the ’90s era of boy-based bands who wore a ton of actual props—you know bandanas, necklaces, necklaces, goggles. I’m talking about one guy, wearing all of those things. 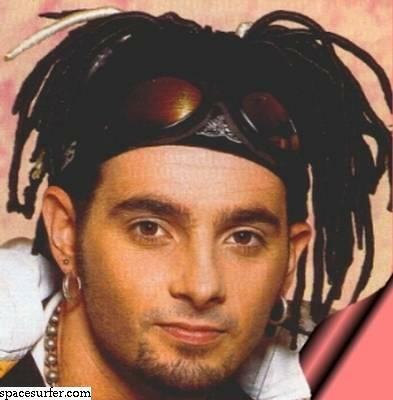 I’m talking about Chris Kirkpatrick. Please bring it all back! When music met fashion, it birthed the best footwear I’ve ever owned: 14-hole, calf-length boots. I wore them with everything. Sure, the company had been around since the 60’s, but once the Nirvana, Garbage, grunge generation ruled the airwaves, it was hard to find anyone who didn’t own a pair. Reading wasn’t always the coolest but when the Goosebumps series came out (and a new tale month after month), my brother and I read them cover to cover, scared out of our minds. Thanks a lot, Welcome to the Dead House, for being pinned “too scary for children” (which only makes me want to read you more). I attribute my [now] love of reading and writing to fantastic authors like R.L. Stine for lighting the flame. I only wish the series could continue now that I’m definitely old enough to read alone in the house with all the lights on. Named after a brand of juice made from passion fruit, orange and guava, you’d never expect to get SO MUCH JOY from these little discs. You started with your own stack of THE coolest Pogs you could gather, take your slammer, which is the essential game piece made of a heavier material, and toss that baby down onto the stack. You then re-stack the leftovers and continue until someone is declred the poggiest pogger in the history of the universe. I know, the ’90s are long gone. But as I think back to those melodramatic days when boys and grades were all the problems I had, I start to miss those fads that came and went too quickly. They had such potential. I can only hope they’ll come back around the same way scrunchies and popped collars did. Wait, didn’t they?